KawaiiPunk - Kawaii Mascot Blog: Bubble Doll. Love at First Sight! Georgeous, aren't they! The cuteness of the characters alone is enough to get any kawaii shoppers’ heart racing! Combine this with the fact that Bubble Doll sells cards and prints, as well as t-shirts, and you know you’ve found a keeper! Simply irresistible! In fact, I’m going to head over there again, right now! I suggest you do the same. 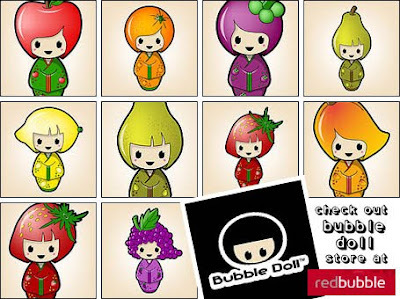 Hope you all fall in love with Bubble Doll’s shop too!